I feel proud and happy to welcome you to this prestigious institution known as Shri SPACE (Shri. ShankarPrasad Agnihotri College Of Engineering, Wardha). The Agnihotri group of Institutions is a large tree of education in this region which is flowering and fruiting since last decades . The branch to this tree in the form of Engineering college started in 2007 . The idea was to give facility to brilliant students of this region for engineering education . In addition to the academic education we are also interested in developing Indian Sanskar, culture and discipline among students. We wish to enhance our wings at global level and launch academic programs in collaboration with international universities and institutions. We look forward for bright, excellent and meaningful future of our students. 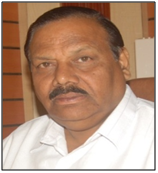 Secretary, Jai Mahakali Shikshan Sanstha,Wardha. Our vision is to develop a strong, enthusiastic manpower from Engineering Stream with an excellent academic standing of a global level. The globalization has created many challenges of Competition, training and placement of engineering students. We will certainly care for humanitarian aspect of education.Our Mission is to provide world class excellent teaching, training and environment for students. To imbibe and cultivate the spirit of brotherhood, cooperatives and team work in students. To inculcate novel ideas about designs, programs and processes in the latest fields of engineering. To have very strong industry institute interactive and germinate the seeds of entrepreneurship in students. To develop personality of the students by various activities like debates, discussions and cultural programs.